If human behaviour in relation to its context is better understood, then governments can manage city centres in such a way that it will be more attractive for visitors and inhabitants. Pedestrians will feel more at ease, will be happier and will enjoy being in a city centre. Eventually, pedestrian models for urban environments might predict behaviour and guide it accordingly. Street life will flourish and city centres will become safer because there are more eyes on the street, as many famous urbanists have said. Urban economies will improve as longer visits mean more money spending. To give the streets back to the people, street activity and quality are critical for urban life in today’s society. Our research focuses on this link between human behaviour and our urban environments. More specifi cally we look at how pedestrians move through city centres, examining their routes, destinations, and time spent on the streets. Every environment has its own characteristics and people react individually to that structure in an interactive, passive, or avoiding way. Through our research, we map and measure people’s behaviour in order to gain knowledge about their movements. In this vein, we can make evidence-based recommendations for change. For this research project, we specifically looked at pedestrian use of the city centre and the quality of the public space in order to provide spatial design interventions that would improve public space for pedestrians. We used GPStracking technology (temporal-geographical information), questionnaire surveys, and trip diaries (social-geographical information). 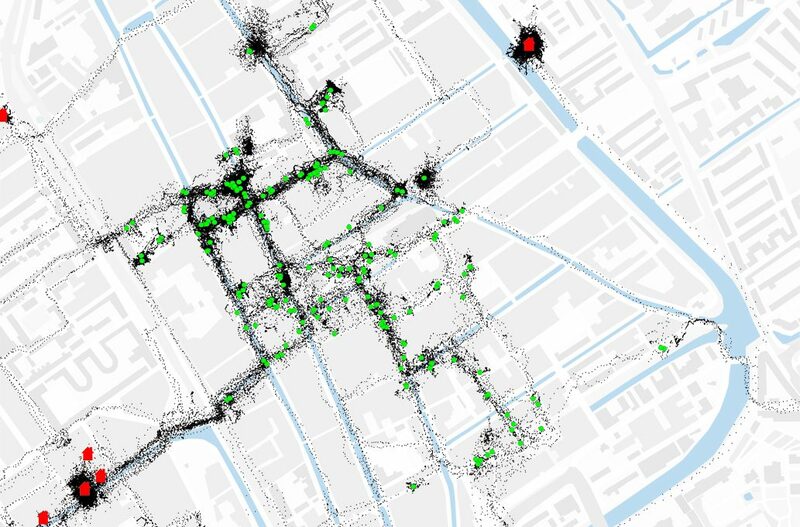 With two research project pilots, one for visitors (like tourists) and the other for city centre and neighbourhood inhabitants, we followed 403 people throughout the city centre of Delft: a city with circa 100 000 residents, a picturesque city centre and a prominent university. We tracked participant’s every movement and mode of transportation outside the house and then conducted a visual analysis of the streets that they chose—or rather, didn’t choose—to travel. 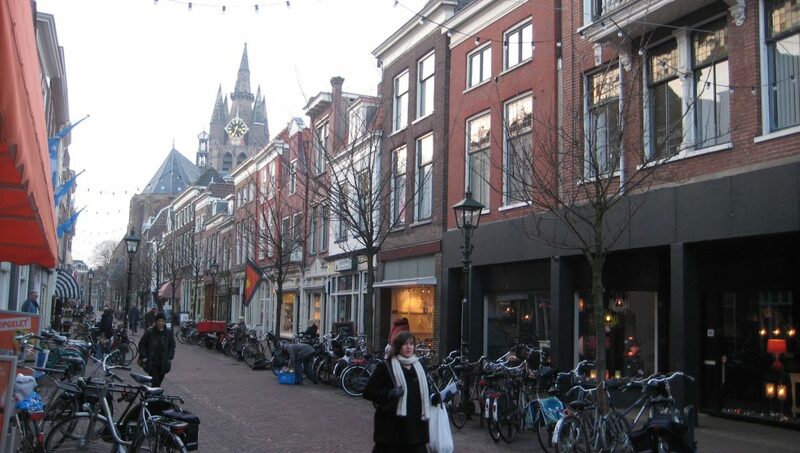 For the most part, participants chose to walk or bicycle to Delft’s city centre, and their main purpose was for shopping activities. Movement concentrated on some streets over others. We found a particular pattern with the streets pedestrians chose to ‘enter’ the city centre: participants chose an entrance street with shopping functions before they continued their trip into the centre. More interestingly, pedestrians made little use of what we found to be well-connected streets according to the Three-Step analysis. Land use analysis demonstrated that these streets had few functions, or were solely residential. Since shopping is the main reason for visiting the centre, this analysis is logical—those streets will not attract people because they have little or no shopping function. Most destinations can, logically, be found in streets that belong to the central shopping area. Consequently, streets which lack facilities, especially a linked chain with different programs, are not or much less visited by pedestrians. As previous research shows reasons to visit a city centre are mostly limited to shopping and leisure activities. 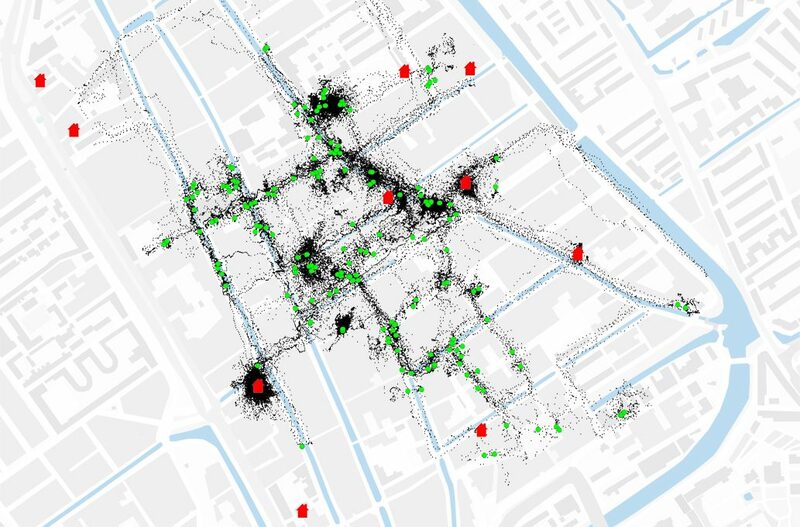 Once we analysed the movement of the participants, we focused on the visual quality analysis of the public space in the inner city of Delft. This investigation aimed to explain why certain streets were used frequently while others were neglected. horizontal façade rhythms. (Gehl et al., 2006, p. 39). We found many positive critical factors in the city centre of Delft. For example, the Grote Markt demonstrates a busy public square rich in sensory experience, transparent plinths, and vertical façade rhythms. It is a busy square, especially on market days every Thursday. Furthermore, different activities and functions such as shops and leisure can be found. In summertime a lot of terraces can be witnessed in front of the cafes. Events like fairs, military shows and weddings in the historic City Hall can be seen here as well (opposite page). Other attractive streets can be seen here. Details are designed for a 5 km/h scale, windows are transparent, facades are interactive (appealing to many senses), streets are rich in sensory experience, there is a great diversity of functions and vertical façade rhythms appear. The city centre of Delft has some bad quality streets and areas as well. 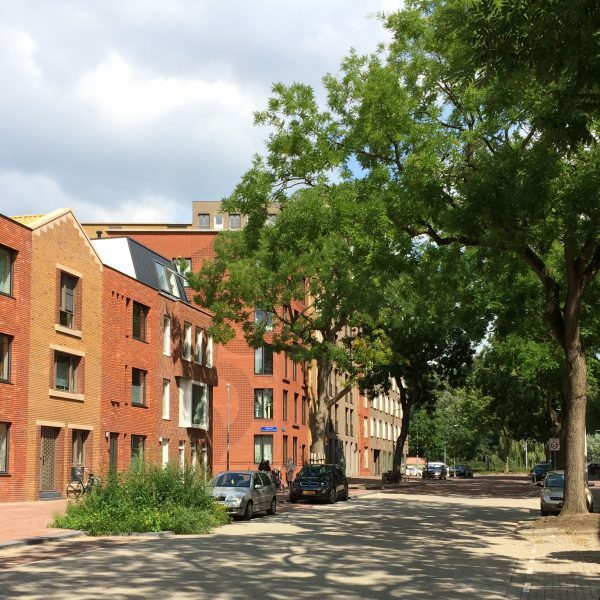 Ezelsveldlaan (page 92) is the perfect example how a ground fl oor façade should not be designed: the façade is closed regarding transparency, passive and not appealing to any sense, boring and not rich in sensory experience, uniform functions and partly horizontal façade rhythms. There is no reason to enter this street unless you need groceries from the supermarket. The façade, which measures 90 meters, has only one entrance (the green circle on the photo) instead of every 7-9 meters to enhance urban life that is recommended by iconic urban thinkers. The other four non-transparent doors in the plinth are emergency exits. 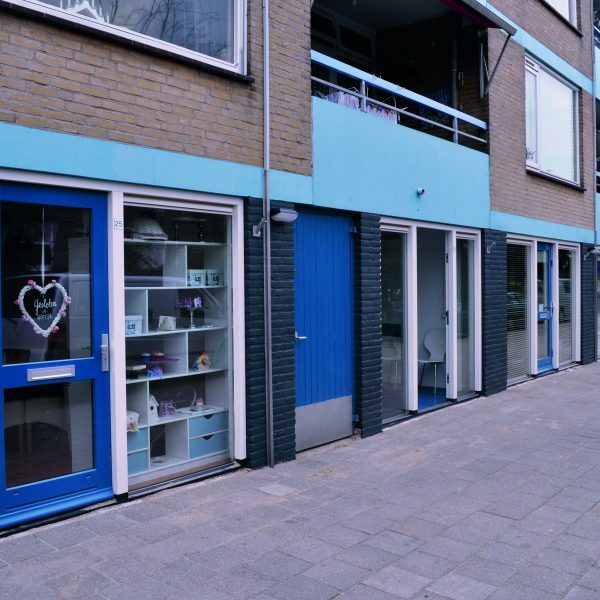 Images below show more examples of unattractivestreets; closed walls, non-transparent windows, and passive facades. These streets are boring with uniform functions and horizontal façade rhythms. Historic city centres offer many attractive public spaces for pedestrians to enjoy. Yet, on a qualitative, observational level, many high-quality spaces are not enjoyed by pedestrians; maybe these places are too far to walk to or perhaps lack a mixed-use program. We concluded that compared to the street quality analysis, pedestrians linger in streets with high spatial quality for greater amounts of time while streets with lower spatial qualities are mostly used as a route and not a place to stay. The exception to this observation is when attractive, mixed-use programs invite people to the space. Important, high-quality streets with shopping and leisure activities, and meaningful, historic landmarks continue to be the main attractors for today’s visitors, although most of the original functions have been replaced by modern ones. We drew three main conclusions from our analyses. 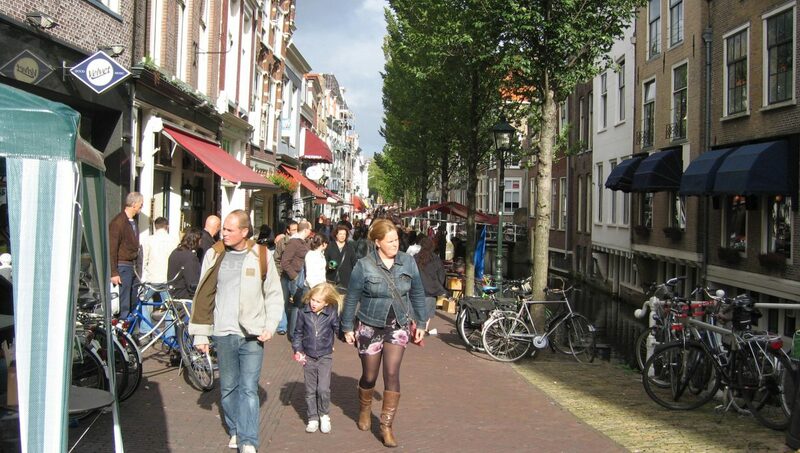 First, city centre streets have many barriers, such as canals, on-going building blocks, and wide auto-oriented roads. These barriers block the natural walking routes for pedestrians. Second, alleys and some buildings exhibit poor maintenance and contribute to perceptions of danger. Finally, we observed the ground fl oor plinths in the shopping area are degraded and are in need of revitalisation. With these conclusions we offered a few different design interventions to strengthen the fragmented urban spaces. Based on our results, we advised the City to better match public space functions to their surrounding land uses, to focus on enhancing pedestrian movement within current city centre redevelopment projects, and to transform under-used parking spaces to pedestrian zones. Patterns of use depend on land use (activities) and network (efficiency, accessibility). The choices people make are based on two things: first, their existing knowledge of the city, and second, chances for creating new knowledge of the city. Using the main shopping streets provides the opportunity to stop here and there. Sometimes these stops are not planned – they’re impulsive. That’s what the city should offer – impulses for the unintended. Without new encounters, we have no impulses. So then a real issue becomes the connection between old and new and intervention is essential. Extend the pedestrian area or shopping street network; open the façades; add shop windows; vertically orient buildings. Design should not only focus on the section or profi le of a building, but also the space between buildings. That’s where city life exists and continues. Continuation is necessary to provide access to other places, other points of recognition, points for choosing a direction and returning there from somewhere else. ALEXANDER, C.; ISHIKAWA, S. and SILVERSTEIN, M. (1977) A pattern language: towns, buildings, construction. New York: Oxford University Press. GEHL, J.; JOHANSEN KAEFER, L. and REIGSTAD, S. (2006) Close encounters with buildings. Urban Design International, 11 (01), pp. 29 – 47. HOEVEN, F.D. VAN DER; SMIT, M.G.J. and SPEK, S.C. VAN DER (eds.) (2008) Pedestrian mobility and the regeneration of the European city centre. Street-level desires: Discovering the city on foot. Delft: TU/Delft, Department of Urbanism. JACOBS, J. (1961) The death and life of great American cities. (1997 ed.) New York: Random House. KORTHALS ALTES, H.J. 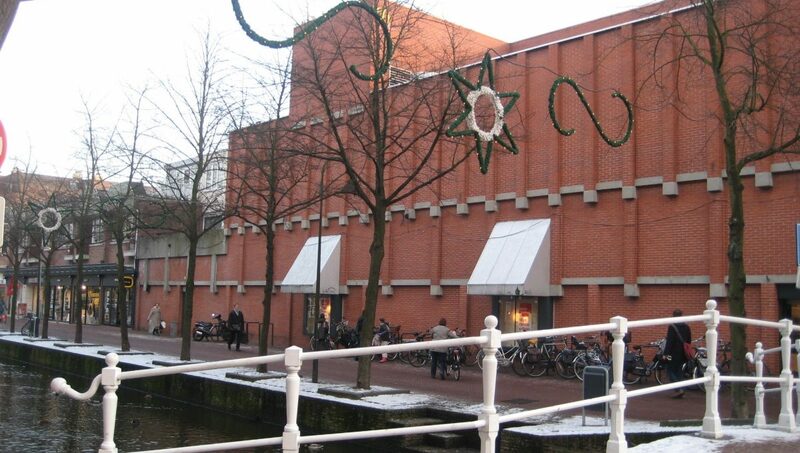 and STEFFEN, C. (1988) Beleving en routekeuze in de binnenstad van Delft. Delft: Delftse Universitaire Pers.